My sister is recovering! If you've not been reading my blog long, you may not know that my sister has been close to death pretty often over the last 5 years. This time I really thought she might not make it – but she's better! Medically, the IV antibiotics and good care are what did the trick. Spiritually, I can't help but think all the prayers had something to do with it. Thanks to all of you who did that part :-). In other news – I did buy a robot clock. He can hang or lean against something. He is a 'he', isn't he? Here's the thing… I am feeling the urge to make clocks similar to these. Different, maybe better (or worse). I need tins or small cans that are painted – not the ones with paper on them. I've talked to Steve (because he does our grocery shopping) to ask that when he's buying something, buy the cute thing if possible. Even jar lids are useful. Altoids tins, wasabi cans, that sort of thing. So, if any of you find yourselves about to throw out a cute thing like that perhaps you can set it aside. 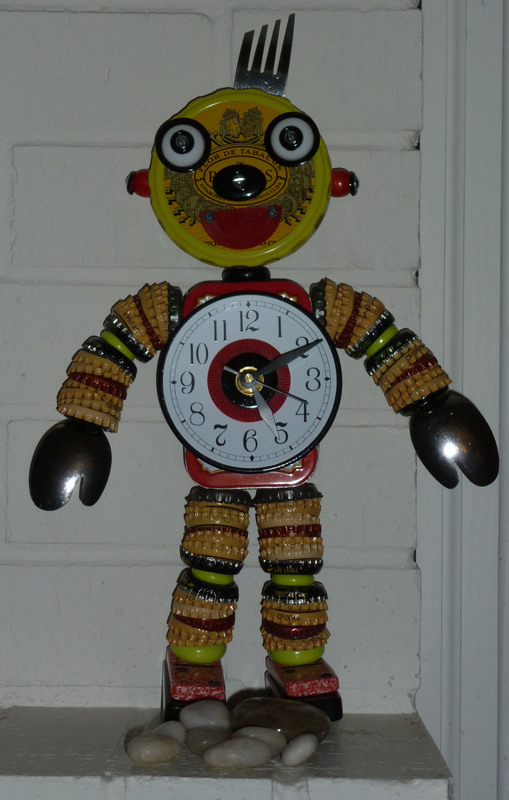 Maybe there is a cheap and easy way to send them to me – or better yet, you can make a robot clock of your own! While in Berkeley, I got to shop for produce at the Berkeley Bowl. Boy, does our produce in Sherman look weak now. Anyway, I bought the cutest little pink apples. I didn't bite into one until I was at the airport to fly home and I about dropped the thing when I realized this is what I was eating. It tasted just like an apple, maybe a bit more tart. But it was sort of creepy. FYI – the apple is sitting on a scarf that I bought when shopping with Lynn, my editor. She is as dangerous to shop with as I am – she helped me see how much I 'needed' this scarf. I'm glad she did. So glad your sister has turned the corner! She has had such a very rough go of it as long as I’ve been reading. Love the clock, you picked my favorite. as for making one…lol…not for me but I’ll sure enjoy reading about your journey Becky. Glad your sister is doing better and that you brought the clock home with you. Why did the apple look that way? I think that apple is supposed to look that way. Im sure it was not a cheap apple, but it was small and cute and I only got two… who knew it was red in the center! Would I get another one? No. It was interesting but not the most spectacular as far as flavor goes. ohhh – drops for the irritation! Ill ask my Dr about that tomorrow because the part of the shunt at the corner of my eye made me crazy the last time. For sure the robot is a he… Have fun making more, I am sure your grandchildren will give you a helping hand with everyone having a great time. Best to your sister and your tear duct surgery. Our daughter picked up a similar “fruit” at a Farmer’s Market in Thorp, WA in the Cascade Mountains. Her comment was that she found them piled near the plums so she wasn’t sure if it was a plum or an apple. I loved the robot clocks. I’m looking for a project to replace the gingerbread houses with my grandchildren. Have to think about it. Wishing your sister good health -our families are so fragile, while seeming so strong. So glad your sister is feeling better! I wonder what they did to give that apple pink flesh? Have fun making the robot clock! 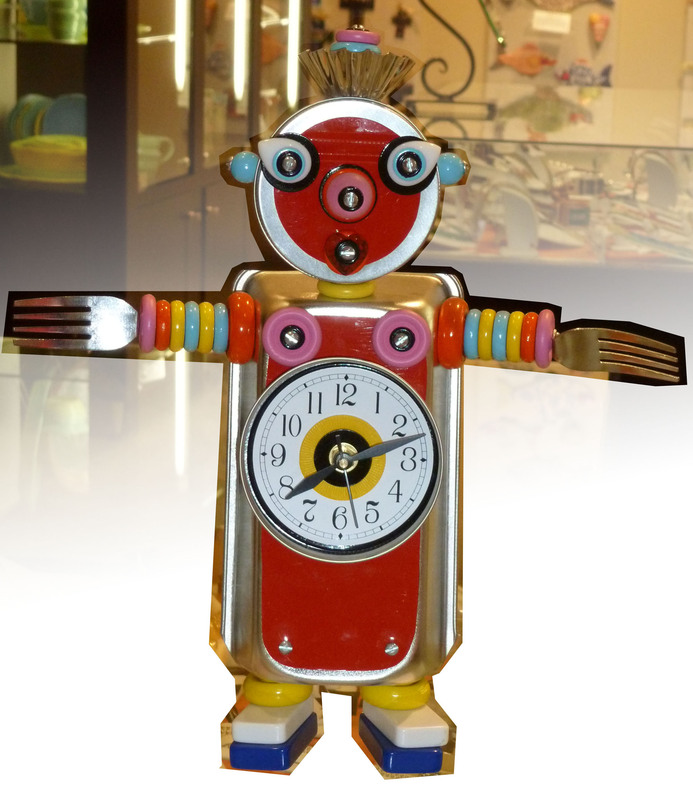 Would you be willing to share where you got your robot clock? My college age grandson would LOVE to have one of those! Many, many continued blessings to your sister and her entire family. My own S-I-L was near death last February and air flighted off a cruise. I posted and asked for prayers and she not only fooled them by surviving the 1/2 hr. Coast Guard helicopter flight to the Florida Keys but is still alive today. She has been denied a kidney transplant twice but we are all still praying. And yes…I’m so with you on the spiritual manifestation of prayers in action!!! 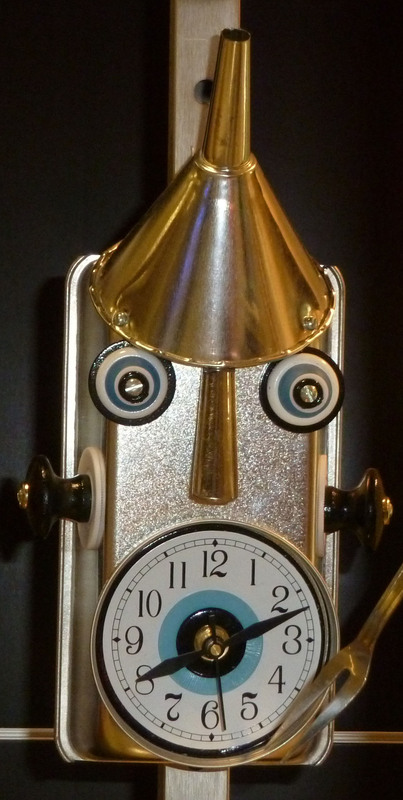 The robot clock is VERY cute. I’m looking forward to seeing your versions! So glad to hear your sister is feeling better–she deserves to have some good times, for sure! The apple is very cute–too bad the flavor didn’t live up to its cuteness!